Irtiqa: Is it good news that Maui is picked as the site for a new Solar telescope? There is enough controversy over observatories on Mauna Kea, Hawaii. This is a complex issue and all sides have been engaged in tough negotiations. 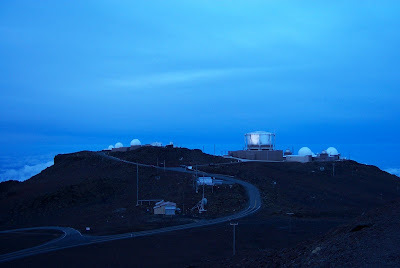 For optical and near-infrared astronomy, it can be argued, that Mauna Kea is perhaps a unique location. Therefore it wasn't much of a surprise when the it was picked as the preferred site for the Thirty Meter Telescope. But right on the heels of this decision, we get the news that the National Science Foundation has selected the top of Haleakala on neighboring Maui as the site for the largest optical solar telescope. Some of the issues on Maui are the same as on Mauna Kea: religious, cultural, and environmental. 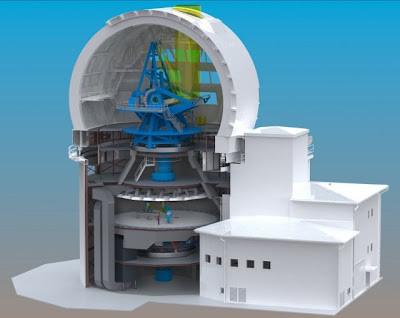 And like Mauna Kea, the $300 million solar telescope (The Advanced Technology Solar Telescope - ATST) is also expected to create 35 full-time jobs for mostly locals and inject $18 million annually in Maui's economy. But...it will also require a large structure on a mountain much smaller than Mauna Kea. The telescope structure is expected to be about 140 foot above ground (see specifications at the telescope FAQs) and, as you can imagine, it will be quite prominent on the island. Yes, there are other telescopes already on the mountain, but none has an observatory structure quite as big as this proposed telescope. While the site has been picked, the project still has to be get an approval from the Board of Land and Natural Resources (BLNR). So how do I feel about the project? I can see why the University of Hawaii would want to have the telescope built over there. It will bring in investment and prestige to the university, in addition to grant money as a result of the telscope. But I think this is a short-sighte d decision and can possibly even have negative impact on negotiations taking place on Mauna Kea. It is not always about legal matters and economics alone. Building a long-lasting trust with the local community is equally important. Otherwise, these projects will be mired in more and more lawsuits. I may be missing something here, but how essential is Maui for solar observing? It is quite likely better than Big Bear Lake, California and the Spanish Canary Islands (the two other finalists) - but by how much? Is the improvement we will be getting really worth an additional entanglement with environmental issues and the local Hawaiian culture? I really hope that the NSF weighed on these issues properly and also took any potential backlash on Mauna Kea into account. Personally, I would have advised NSF to pick a site other than Maui. The federal government's Advanced Technology Solar Telescope, a highly controversial project to study the sun that's $23 million in planning and 10 years in the making - so far - will receive the money it needs to be built atop Haleakala. After the completion of a long-awaited environmental impact statement this summer, National Science Foundation Director Arden Bement officially selected Haleakala last week as the site of the planned 143-foot-tall telescope and funded the $300 million project, according to a decision made public in Tuesday's Federal Register. A slew of contractors will build the telescope over the next seven years on a half acre within the University of Hawaii's Science City, a cluster of observatories near the summit, said UH Institute of Astronomy Assistant Director Mike Maberry on Wednesday. However, Maberry said the state Board of Land and Natural Resources still needs to vote on the project in the coming months before it can move forward. 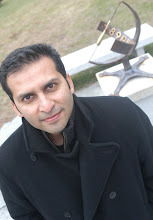 Nevertheless, he said he expects construction most likely to begin in the fall of 2010. "This will allow for the greatest advancement in our understanding of the star that allows life to exist on our planet," Maberry said. However, the project's opponents, including Kahu Charles Kauluwehi Maxwell Sr., said the telescope is unnecessary, ugly and extremely disrespectful to the Hawaiian culture. Haleakala is considered a sacred place, in part, because monarchs were buried nearby. "Now the battle starts," said Maxwell, a 72-year-old with failing health who learned about the decision Wednesday via e-mail from the National Park Service. "It's not over. Native Hawaiians should gather with me, and we will all lay our bodies down in front of the tractors. This will be my last stand. "There's enough junk up there already to completely annihilate the spirituality of Haleakala," he said. Read the full story here. Also see a recent post about Mauna Kea here. Plus, here is the official Advanced Technology Solar Telescope (ATST) website, and here is one, Kilakila Haleakala, that is opposed to the proposed solar telescope.